Sign up for the Dollar Bead Box subscription. Receive a Box of carefully selected products every month. Guaranteed $60 value in every Box! Box Subscriptions start at just $18.50 per month + Free Shipping! 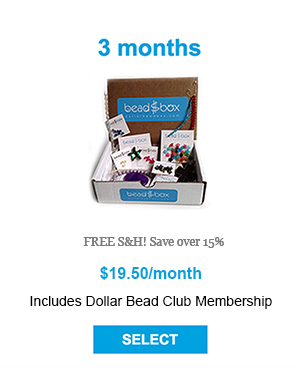 Free automatic enrollment in the Members-Only Dollar Bead Club for recurring order subscribers! Every month, a wonderful new Box of beads and beading products arrives at your door. Every Box includes 12-15 exciting new products, beading favorites, the latest styles and colors, and items exclusive to the Dollar Bead Box - a value of $60! Now comes the best part! 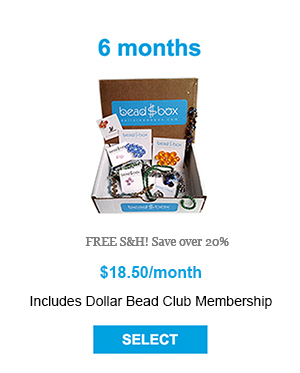 As a subscriber to a recurring Dollar Bead Box subscription, you are automatically enrolled as a Dollar Bead Club Member for Free. Enjoy exclusive access to all the items in our online Shop. Reorder any of the items in the Box and in our Shop for just $1 each! 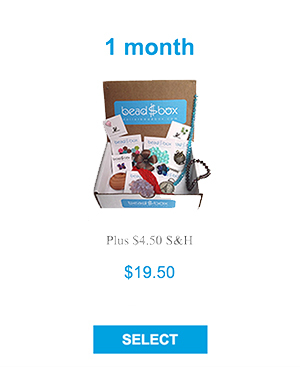 Dollar Bead Box subscriptions automatically renew, so once you place your order, you can sit back and enjoy each month's delivery.